Warning: This story contains disturbing language. Thirteen-year-old Jimmy Assiniboine’s family was shocked to discover the letter on their doorstep New Year’s Day. 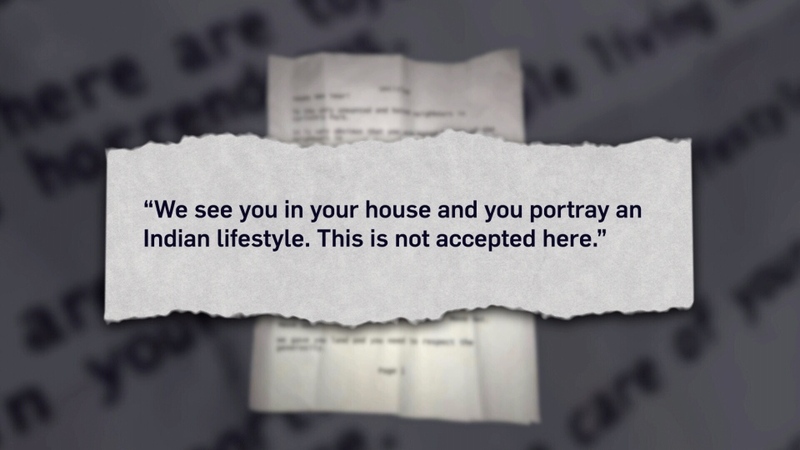 The letter bears a striking resemblance to one received in October by an Indigenous family in St. Albert, Alta., addressed to “the very unwanted and hated neighbours” in that community. “Move out or things will escalate,” read the letter received by mother of three Katrina Anderson. “Would not want to see the kids getting hurt. This isn’t a reserve,” it said. Anderson’s family decided to move after receiving that letter, which includes much of the same language as the one Assiniboine’s family found earlier this week, sentiment the Deputy Mayor described as uncharacteristic of Leduc. “This letter does not represent the spirit of our community, which is one of diversity and inclusion,” said Bill Hamilton in a statement Wednesday. The incident is under investigation by police, but isn’t the first time the family says they have been harassed. They have put up protective rocks around their front lawn to prevent people from using vehicles to ruin their grass. The air has been let out of their car tires before, said Assiniboine, and the bolts were even loosened once. They didn’t notice until another driver alerted them on the road. By then, the rim had warped. “My mom is a sweet person, I don’t know why anyone would do this, because that could have killed us,” he said.